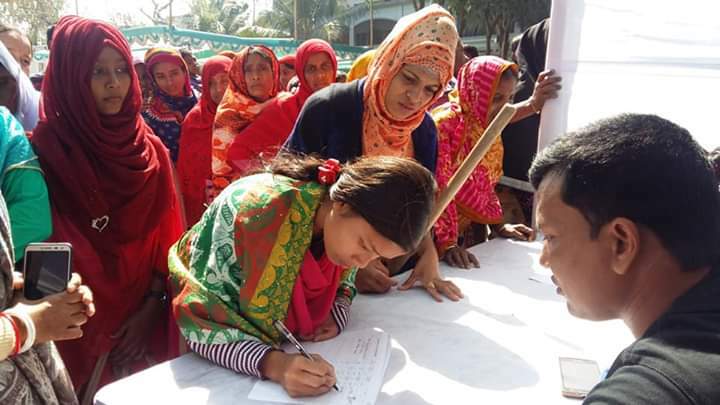 On March 1, 2019, Prottasha Protibandhi Nari O Shishu Unnyan (Prottasha) organized a legal aid camp with support from BlueLaw International, LLP and Bangladesh Legal Aid Service Trust's (BLAST) Rangpur Unit to link prospective justice-seekers with disabilities with legal aid providers. Approximately 150 persons with disabilities attended the daylong camp to learn about their rights under the Disabled Persons' Rights & Protection Act, 2013 and how to present claims under Sections 36 and 37 of the Act. Ten persons with disabilities received individual legal advice at no cost, and 2 are preparing to present claims. Prottasha, a women with disabilities-run disabled people's organization (DPO), is one of seven DPOs throughout Bangladesh to receive small grant awards from BlueLaw International, as part of USAID’s Expanding Participation of People with Disability program, to mobilize diverse stakeholders in Rangpur to promote effective implementation of the Disabled Persons' Rights & Protection Act. All small grantees receive technical support from BlueLaw's national-level partners, the National Grassroots Disabilities Organization (NGDO), National Council of Disabled Women (NCDW), and BLAST. Photo caption: A woman with disability in Rangpur registers to receive free legal aid in order to seek redress for a violation of the Disabled Persons' Rights & Protection Act, 2013.